Artist’s conception of wreck of steamboat Rebecca at Parkersburg, West Virginia on Dec. 7, 1869. Deep in the rugged interior of the Mountain State, where rivers arise as tumbling young streams, it can be easy to forget the broad waters of the Ohio. Yet the history of West Virginia is inextricably linked to that mighty river, by way of which its salt, oil, coal, and timber first reached burgeoning Midwest markets. While its interior remained virtually a wilderness through the late 1800s — the domain of only a few hardy farmers and hunters, the Mountaineers, as they came to be known — wharves along the Ohio bustled with commerce, and communities such as Wheeling and Parkersburg blossomed into cities. Just a few minutes after 11 o’clock on the night of December 7, 1869, at Parkersburg, the sound of a great, solid impact was heard, and the bell the courthouse began ringing. The townspeople were startled, some leaving their beds. Many, like Jimmy Mehen, ran out without shoes or coat. All this was in answer to a summons from the river — the steamer Rebecca was in peril. The steamer Rebecca had passed between these piers many times. This morning she left Wheeling on her usual run down river. She was one of the finest boats on the Ohio. Her hull was unusually staunch, while her cabin was a model of taste and beauty. The Wheeling, Parkersburg & Cincinnati Transportation Co. had paid $22,500 for her in 1867 and spent $8,000 putting her in complete repair. She was a favorite with the traveling public. Parkersburg, Virginia, as it appeared in the 1860s, Ohio River at left. (Illustrator unknown). She was running late that night and as she approached the bridge in her usual course between piers 3 and 4 and struck a barge loaded with stone that was anchored just to the left of pier 4. The impact was terrific and completely demolished her starboard forecastle. Almost thrown from the steering wheel, her pilot began ringing the distress bell frantically. That was when the courthouse answered in warning tones. The wrecked boat began at once listing, turning, and careening with the current. Hugh Irwin, the second mate, shocked by the sudden jar, rushed from the stern deck to the forecastle and found the hull rapidly filling with water. He gave the alarm, hurrying to notify the officers and some 40 passengers of the impending danger. James Stevens, first engineer, stood at his post until the engines refused to work and the water came up to his footboard when he darted through the window of his room and climbed a fender to the boiler deck. From there he hurried to the roof of the hurricane deck with the water following. Ed Muhleman, the first clerk, was awakened from his sleep in time to save the passage book, log book, money, and other valuables from the office. All passengers were now aroused, excited, scrambling around furniture, and, amid the yells and hissing steam, trying to get aloft. When the boat and barge collided, Charlie, the bartender, was pouring a stiff drink for a thirsty customer, but he never finished. For just as the bottle was jarred from his hand, both men rushed madly outside and leaped overboard. Though Charlie was a good swimmer, the darkness of the night, or the fatigue of his day’s labor, had impaired his sense of direction. He headed with an overhand crawl toward Blennerhasset Island. Two other men from the bar room, probably well fortified with liquor, followed Charlie’s example and plunged into the Ohio to take their chances against the current. A dignified old gentleman with side whiskers was so startled by the imminence of a watery grave that he scrambled up to the hurricane deck without shoes or trousers and stood shivering in embarrassment. All this had happened in three minutes while the Rebecca was drifting and rapidly sinking. At a distance of 200 yards from the pier, she grounded in some 20 feet of water and lay with only her hurricane deck, texas, and jack-staff exposed. And there on the hurricane roof, a motely crowd of half-dressed, excited, and bewildered people awaited their fate. Women were moaning, crying, and calling on the Lord for assistance in that dark wintry night with the current of the Ohio swirling menacingly about them. One old lady was heard to promise that if she got out safely this time she was resolved to lead a different life. But all passengers on the Rebecca were saved and all on that fateful boat except five unfortunate members of the crew who were trapped far below the hurricane deck. Within 10 minutes after the first alarm, the riverbank was lined with people, all eager to extend aid to those men and women marooned one-third way out in the river. There were many cases of personal daring and prompt action, though only a few boats were available. Mr. Clement, agent of the B&O Railroad, rushed to the telegraph to signal the office on the Ohio side, but the operator at Belpre had retired. He then went over to the sunken boat and was untiring in his efforts to render assistance. Young Jimmy Mehen, still barefoot, brought away the first skiff-load of passengers. George Cross and others from the steamer ‘Thompson’ also went out in yawls. There were five skiffs in all, and in three trips they had all the survivors on land, including the bartender. These shivering, grateful people were immediately taken to comfortable hotels, even though the dignified old gentleman with side whiskers had to enter the lobby without his pants. It was the crew — the men below decks, the men who had labored all day to bring the Rebecca from Wheeling to the fateful pier — that lost their lives because a barge was anchored in the way. The bodies of Sanford Carr, a fireman; Young, a striker; and three others by the name of McBride, Henthorne, and Poole were found in due time. On Wednesday, December 8, an inquisition was held at the wharf to view the body of Richard Poole, the first victim recovered. It was the opinion of the coroner’s jury that Poole came to his death by drowning, that the B&O Railroad was ‘very reprehensible’ for neglecting to place proper lights on the barges, that the barge with which the steamer collided had no light on it, and that the steamboat pilot was not at fault. Harry Olim, the pilot on watch, was the kind of careful, efficient riverman that Mark Twain later wrote about — a man who took pride in his work and knew the channel in every trivial detail. He was one of the most respected pilots on the river, and all those who knew the circumstances of the disaster felt he was not to blame. Although the Rebecca was unfortunate, it was indeed fortunate that the accident did not occur the week before when the Ohio had reached a flood stage of 29 feet. Not a soul could then have been saved as the water would have covered the Texas and probably the pilot house. 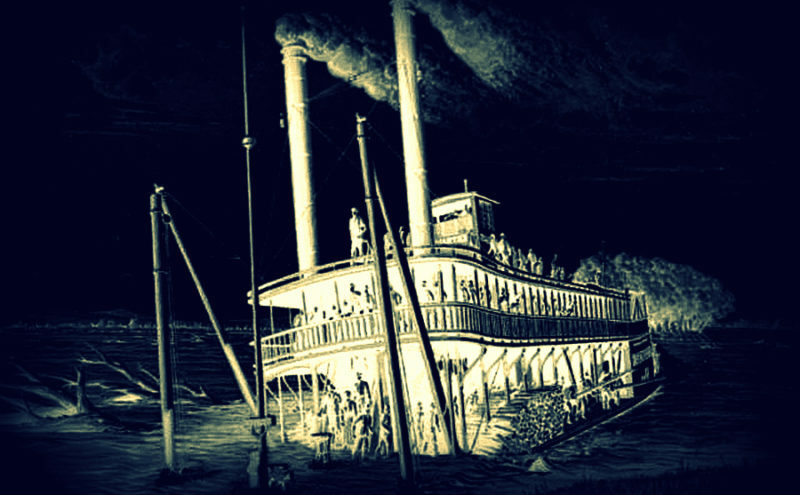 The steamer Rebecca was a complete loss, though her machinery was later recovered and installed on the Courier. Her owners had refused an offer of $25,000 for her the previous summer, but she was insured for only $15,000. Could a pirate treasure on the Ohio River be lost for good?